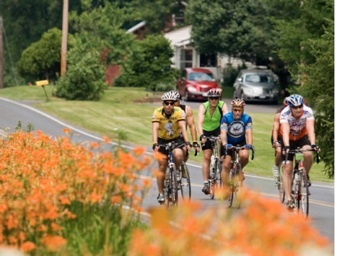 For the past many years, Tom collaborates with Jeanne Imbrigiotta to create the hour-long documentary post-card of the “Ride for Runaways”, presented to each bike ride participant at an annual dinner. The “Ride for Runaways” is a yearly 500-mile bike ride to benefit “Anchor House”, a shelter and multi-service agency that serves children and families in Trenton, NJ. Tom and Jeanne film each day of the ride, interview the riders and support staff, help keep the riders cool on hot days (love those super soakers!) and Tom plays the accordion to help the bikers make it up the steepest of hills. And that’s only a very small part of what they do. When the ride is over, their work really begins. They edit the hundreds of hours of video, and Tom, along with Joe Bezek, creates original music to fit the scenes, while Jeanne creates all the artwork. This is truly a labor of love!